ASCA International Workshop Inside Knowledge: (Un)doing Methodologies, Imagining Alternatives, March 28-30-2007, on invitation of Pieter Verstraete. 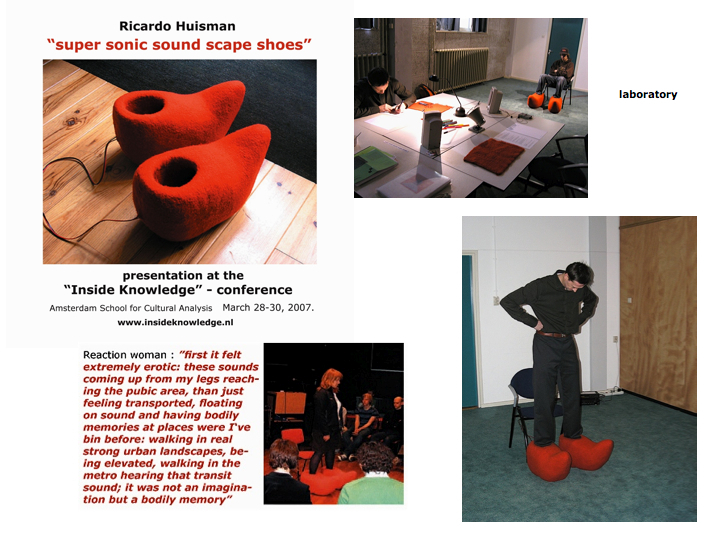 The red woollen “super sonic sound scape shoes” installation is an experimental, multi-sensorial and tactile soundsculpture. This interactive installation was presented during the ASCA International Workshop “Inside Knowledge” at the University of Amsterdam and it was open to both the conference participants and a more general audience. The installation reproduces a narratively composed soundscape that was purposefully designed for the context of the conference. The “Inside Knowledge” soundscape could be experienced as a representation of a ‘soundwalk’ through the ASCA building, through corridors, classrooms, the library, until it ends ‘being inside’ the knowledge of two lectures with a reading about the grain of voice (Roland Barthes) and a discussion on sound habitats. 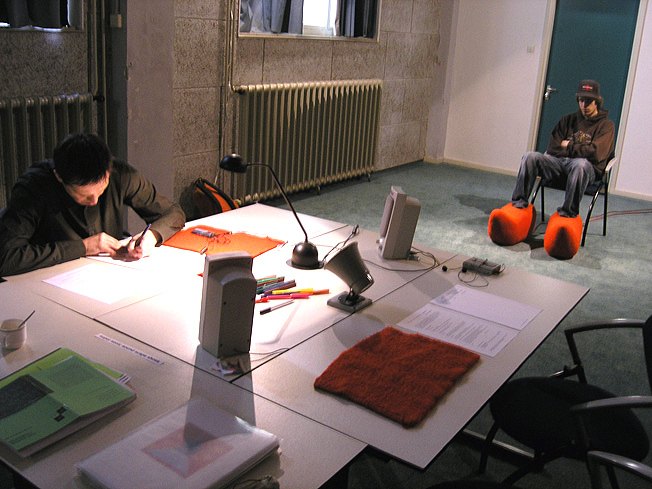 During the conference, the “super sonic sound scape shoes”- installation was accessible in a kind of ‘laboratory’-setting’. Several participants of the workshop and students from different countries and disciplines visited the laboratory. This contemplative space gave them the possibility to concentrate on their own bodily experiences of the installation. Each visitor was kindly asked to give written or spoken feedback afterwards. There was also the opportunity to talk with the artist or other people in the laboratory sharing experiences, associations, memories and discussing ideas. soundscape composition: “Inside Knowledge” 30:14 min. The total soundscape could be experienced as a ‘soundwalk’ through the ASCA-building: through corridors, spaces, visiting the library and college and at the end being inside the knowledge of two college’s having a reading about the grain of voice and soundhabitat in a way conceptualizing the ﬁrst parts of the soundscape. The ﬁrst part: walking through corridors, spaces, and feeling the sounds of old instruments (of apartment of musicology): a emerging imaginative, sometimes rhythmic soundscape triggering bodily sensations and bodily memories. The middle part: visiting the library, the introduction of a somewhat authoritarian alienating voice talking about bodily knowledge: ‘you are walking without moving’,’you are walkreading’,‘knowing through the body inside, outside’ triggering a cognitive rethinking of the experience in that moment. The last part: entering an ofﬁce with two colleges P. and C. having a reading about an “Inside knowledge”- essay and talking about: way’s of listening, being open for the known and the unknown, soundscape and sound-habitat, the grain of the voice: appealing the rational and the physical at the same time. While standing in the “super sonic sound scape shoes” the voices of the man and woman can be felt at both feet in combination with emerging background sounds at the end. special thanks to Pieter Verstraete, Carolyn Birdsall, Chiel Kattenbelt, Eloe Kingma, ASCA-students and all participants. This workshop / presentation is kindly sponsored by the NWO (Netherlands Organisation for Scientiﬁc Research).